Milk replacers, like soy, can help with product texture and color. Why replace milk in baked products? For it’s foaming capability within cakes and frozen desserts. Options for home bakers are plant-based milks made from soy, almond, cashew, rice, oat, hemp, coconut etc. Factors to consider when choosing the replacement are flavor and texture. For example, almond milk has a distinct flavor, and rice milk is thinner while soy milk is thicker. Soy flour was first used as a substitute for milk powder in bread since World War II. To this day, the main usage of soy flour in breads is as a replacement for nonfat milk solids. At the level of 3% substitution for non-fat milk substitute, bakers do not find any appreciable change in absorption, mix, and oxidant requirement. When soy flour replaces nonfat milk solids in cake, it is often observed that cake tenderness and texture are improved. Cake formulations are more tolerant to process and ingredient variations when 2% soy flour is used. Better results were reported with high-fat soy flours in cakes than low-fat or defatted soy flours. 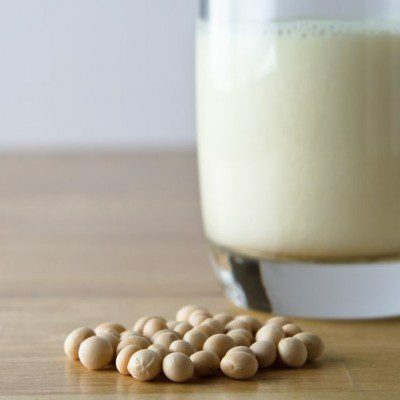 The soy industry now supplies a wide range of products for the baking industry: enzyme-active soy flour (used up to 0.5%), toasted soy flour, chemically treated soy flour, lecithiated soy flour, full-fat soy flour, concentrates, and soy isolates. Gluten is heat stable and has the capacity to act as a binding and extending agent. It is commonly used as an additive in processed foods for improved texture, flavor, and moisture retention. Gluten is increasingly separated from wheat (known as “vital wheat gluten”) or modified for specific uses (known as “isolated wheat proteins”) to improve the structural integrity of industrial bakery products. Eggs are used in cake. They exert an aerating and binding effect, retaining the air which has been beaten into the mix and maintaining the cell structure of the batter during the baking process, thus imparting lightness and characteristic texture to the cake. They give a pleasing color and flavor to the cake. They have a considerable emulsifying power, owing to the high fat content of yolk, and a shortening action. The presence of egg in a cake retards loss of moisture from the baked products, thus keeping the cake fresh for a longer period. Fresh and frozen eggs have the same properties. While using spray dried eggs, slight modification of normal baking technique is needed and the quality of the sponge cake is a little inferior. Hoover, William J. “Use of Soy Proteins in Bakery Products.” Journal of the American Oil Chemists’ Society 52.4 (1975): 267A-69A. “Milk | Baking Ingredients.” Bakerpedia. www.bakerpedia.com/ingredients/milk/. Accessed 22 May 2017. Aider, Mohammed, Maxime Sirois-Gosselin, and Joyce Irene Boye. “Pea, Lentil and Chickpea Protein Application in Bread Making.” Journal of Food Research 1.4 (2012): 414-31. Aider, Mohammed, Maxime Sirois-Gosselin, and Joyce Irene Boye. “Pea, Lentil and Chickpea Protein Application in Bread Making.” Journal of Food Research 1.4 (2012): 160. Zucco, Francine, Yulia Borsuk, and Susan D. Arntfield. “Physical and Nutritional Evaluation of Wheat Cookies Supplemented with Pulse Flours of Different Particle Sizes.” LWT – Food Science and Technology 44.10 (2011): 2070-076. Biesiekierski, Jessica R. “What Is Gluten?” Journal of Gastroenterology and Hepatology 32 (2017): 78-81. Hawthorne, J. R., and E. B. Bennion. “Influence of Temperature on the Beating and Baking Properties of Spray-dried EGG.” Journal of the Society of Chemical Industry 61.10 (1942): 151-53. “CFR – Code of Federal Regulations Title 21CFR101.82.” Accessdata.fda.gov. 01 Apr. 2016. www.accessdata.fda.gov/scripts/cdrh/cfdocs/cfcfr/CFRSearch.cfm?fr=101.82. Accessed 22 May 2017. Center for Food Safety and Applied Nutrition,Office of Regulatory Affairs. “Allergens – Food Allergen Labeling And Consumer Protection Act of 2004 Questions and Answers.” U S Food and Drug Administration Home Page. 18 July 2006. www.fda.gov/Food/GuidanceRegulation/GuidanceDocumentsRegulatoryInformation/Allergens/ucm106890.htm. Accessed 22 May 2017.